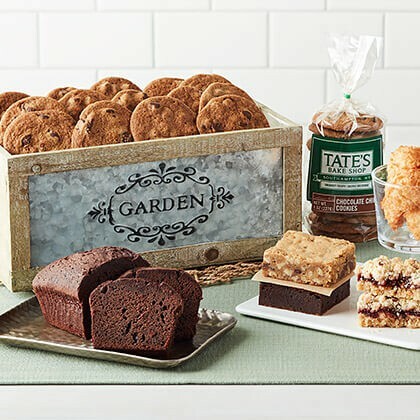 Celebrate summer with Tate's vintage garden tray filled with craft baked treats! Each garden tray is filled to overflowing with thin, crispy chocolate chip cookies - a fan favorite! - sweet and scrumptious coconut macaroons and an assortment of bars. Our moist chocolate tea loaf can be dressed up with whipped cream and berries for an extra special dessert. And when the treats are gone, this tray is perfect for planting summer flowers! I love every thing I ever bought.